Art Spiegelman’s acclaimed graphic novel Maus focuses on a son’s quest to learn about his father’s history as a Polish Jew who survived the Holocaust. The graphic novel is split into two alternating stories: One story is set in the novel’s present, with Spiegelman interviewing his estranged father about his experiences, and the second story is Spiegelman’s interpretation of his father’s life as a graphic novel. Spiegelman famously depicts each race as a different animals: Jews are drawn as mice, Germans as cats, Poles as pigs — a narrative technique that purposely cannot sustain itself when there is a question about a character’s specific race. 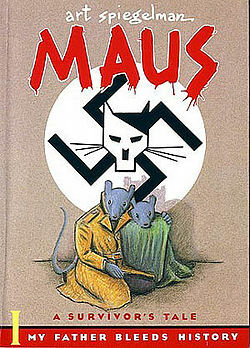 Maus was awarded a Pulitzer Prize in the Special Awards and Citations – Letters category in 1992, becoming the first graphic novel to receive a Pulitzer. In the library world, books are challenged all the time, mostly for making someone uncomfortable with their own view of the world. In our library system, Maus was challenged over its portrayal of the Poles. The challenge was made by a Polish-American who is very proud of his heritage, and who had made other suggestions about adding books on Polish history, for our library’s collection, so it was not out of the blue. The thing is, Maus made him uncomfortable, so he didn’t want other people to read it. That is censorship, as opposed to parental guidance. I don’t think Maus was the intended target for this, obviously. But I think [the law] had an intentional effect of squelching freedom of expression in Russia. The whole goal seems to make anybody in the expression business skittish… A tip of the hat for Victory Day and a middle finger for trying to squelch expression. Download a PDF of the Maus discussion guide here.